Do you long to stake your claim to the wireless wide open spaces? Here's the tool for the bandwidth hog (cybersquatter?) in all of us. WiFi Hog is a laptop-based system that allows the user (or "hog") to gain complete control over public access wireless networks. It is a laptop connected to a Portable Video Jammer (PVJ) that communicates to software consisting of a packet sniffer and wireless stumbler which monitors incoming packets from an open node. 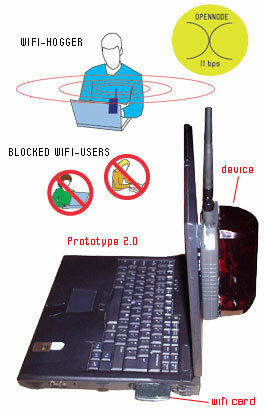 Only the WiFi Hogger's IP address is allowed access, blocking others from the net. The idea is presented as an alternative to the utopian vision of wireless networks being open, shared, and utilitarian for everyone. This project is a cautionary one, and comes as a reaction to the battle over free wireless spectrum where corporate pay-per-use and free community networks are fighting for signal dominance in public spaces. If the option exists to connect and the network is made available then why can't people use it in any way they want - even block it. WiFi-Hog is a personal tool to enable both private interaction in public space as well as social obstruction and deconstruction of shared resources. The creator of this system is Jonah Brucker-Cohen. I'm going to dedicate this story to all you Panther Moderns (from Neuromancer, natch - get your mimetic polycarbon suit on) out there who long to test the limits of tolerance on public networks. Fortunately, this product is not available commercially (yet!). Story found here.